$99.99 & FREE Shipping on orders over $59. We use the term "sack" as a way of describing the high strength of alcohol in mead. 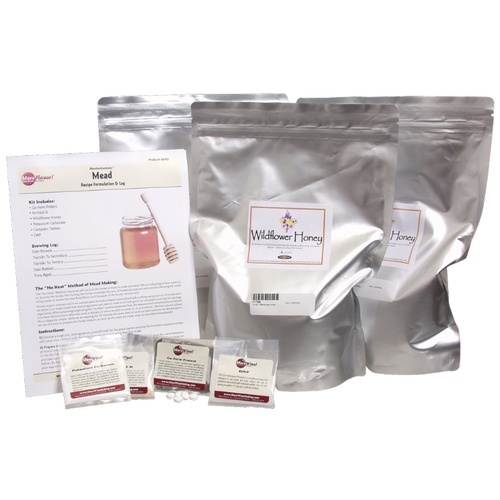 This mead kit features 18 pounds of honey. Estimated alcohol 18-20%. The yeast will die off leaving behind residual sugar. The honey flavor will dominate this style of mead highlighting the honey's natural flavor and aroma's. Absolutely the perfect kit to make a fantastic, unique after dinner dessert beverage to share with your friends. DV10: Strong and clean, stays true to original honey's flavours and aromas. W15: Great aromatic profile (true to the honey source) and heavy mouthfeel. Includes our simple, step-by-step two page instructions, which will teach you the basics of making mead. This kit does not include yeast. Please see our recommendations above. Glass Marbles For Topping Up - 3 lbs. Mead Making Equipment Kit to Make 5 gal. My first mead kit so take my review with a grain of salt. I like sweet mead and I wanted the high alcohol, but the high alcohol content of this mead kit overpowers any sweetness. Had to backsweeten quite a bit and it still can't overcome the "heat" of the alcohol. Yeah it's sweet...but people who try it first comment on the alcohol then mention the sweetness. Will likely not try this recipe again. I used this as a base for a triple berry melomel. It turned out fantastic! Couldn't have asked for better instructions or quality of ingredients. I basically took the kit and replaced 1 gallon of the water with 1 gallon of fresh juiced organic apples. I then let it sit in the secondary fermenter for a month with about two dozen cinnamon sticks. It reached an ABV of about 19% and is absolutely delicious. It has just the right amount of sweetness to hide the high alcohol content. It has a very smooth mouth feel with the distinctive smell of honey and has a lingering taste of cider and cinnamon. This was my first mead/melomel and will definitely be using this kit again. Well worth the money. I'm a beginner home brewer and of course I'm usually brewing beer. But I figured I'd try this and it turned out fantastic. And only took 4 weeks. My ABV was only 14.44% so maybe I have to try again. You have to like sweet to like this one. I know I do.